Straight out of Moe’s Kitchen comes Moe’s Notes. A productive iPhone app, Moe’s notes lets you organize your to-do lists, capture photos, and even include audio. When you begin each note, a screen appears that sections off each feature, making it easy to maneuver through the process. In each note you can include text, a recorded audio message, a picture, and a tag (office, friends, travel, etc.). The last feature allows you to sort through your notes faster by setting the perimeters of office, friends, travel, etc. Once you have created your notes, it will appear on your calendar. You can email this to yourself or someone else, and even send it to your facebook page. This app functions as an organizer for yourself, or a way to connect with friends. If you see something you think a friend would appreciate, take a picture of it, maybe include an audio note, and email it. When you set up a note you can also save it with an alarm. The app won’t alert you of your appointment when you’re not using it, but as soon as you open it after your alert time has passed, it will notify you. I set an alarm and exited out of the app, when I opened it, my audio clip played first thing. The downside to this is you have to remember to open the app to be reminded of your calendar. Sure, the iPhone comes with a handy calendar and alarm feature, but Moe’s notes are far more specific and detailed. If you want to sort through your notes, you can set perimeters to view them in, such as location (GPS coordinates), tags, or dates. The home screen, which lists all of your notes, has these three icons at the bottoms of the screen to filter through. 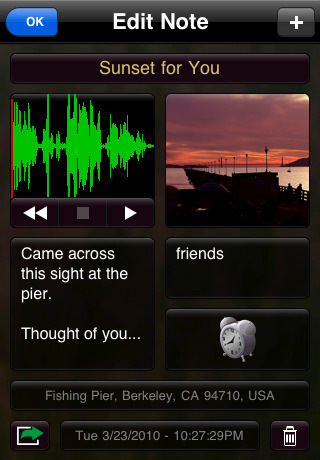 Also included in this app is a note already created titled “Sunset for You” from the developers so you can see how each feature is taken advantage of. You could pretty much spend an entire day playing with each feature of Moe’s Notes, from looking at your statistics on the notes you’ve made, changing the display for each note, even adjusting the pitch your audio is played at (if you’ve got a lot of time on your hands). I get a kick out of creating a note that’s business oriented and serious, and leaving an audio note that makes me sound like I’ve inhaled a helium balloon. Whatever gets you through your busy day. AppSafari review of Moe’s Notes was written by Amanda McFarland on June 20th, 2010 and categorized under App Store, Notes, Productivity. Page viewed 4232 times, 1 so far today. Need help on using these apps? Please read the Help Page.